The British frigate HMS Lancaster has kept busy during its ongoing Caribbean patrol, managing everything from helicopter-aided pot busts to community-works projects on the island of Montserrat. These activities — along with every other activity that isn’t related to Prince What’s-his-name — have gotten little play in the British press recently. 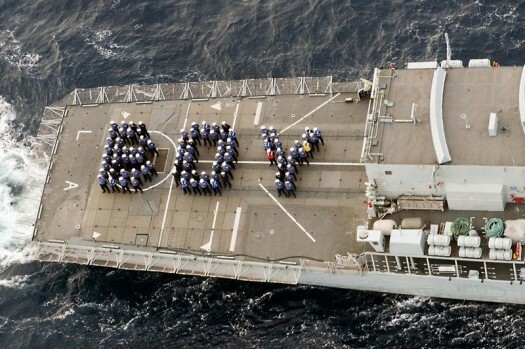 But the photo above, of the Brits aboard Lancaster spelling out a fairly succinct royal birth announcement, did get some media attention — the news agency Reuters released it, for example. Here’s another shipboard shot, via Reuters and the BBC. U.S. forces have yet to spell out any warm wishes, per official Navy photos, but the folks with the Navy football program have their own crown of sorts they’d like to promote via the Royal Baby bandwagon.